Club Penguin Cheats by Mimo777 Club Penguin Cheats by Mimo777: Club Penguin Cart Surfer Stamps! Coolio, don't ya think? So, can you keep up with all the new stamps? Billybob wasn't lying when he said there would be lots and lots of stamps, was he? So how many of these new stamps have you earned? Let me know! NONE!!!! I can get the extreme 1 easily (not gloating) but even that it wont give me a stamp! I have NOOOOOOO idea why? My black puffle doesn't appear on the screen either! I have 108 stamps so far. I got alot so far by getting the wii game... but the games are still pretty tricky with the puffles geting to be in them! dont ya think? Yea, im having that problem too. Just give Club Penguin a few hours, they'll probably have it fixed. It must be some weird glitch. With new updates comes new glitches! Thats one of my mottos! We're all experiencing that weird glitch. Don't worry, im sure it will be fixed, patched, and ready to go soon. Cool! I have 140. It's a race to the finish! Tricky games are the best games. A game would be no fun if it was easy. Tricky games are the best games! A game would be no fun if it was easy. 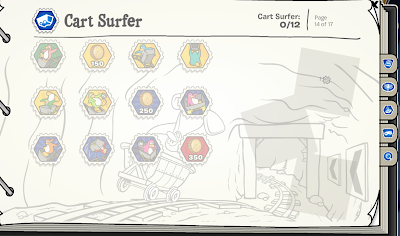 The Cart Surfer stamps do not work... The puffle does not show, and the stamps are not earn-able. They did come out today although they are supposed to come out tomorrow. Maybe tomorrow they will work. I can't get a single stamp but i have earned them. they don,t work at all. ps ive got 139 stamps!!! Cool! Hey, Club Penguin updated their Membership page but I think it's old! sweet i got 8 stamps from this game now i have 96 yay! I'm happy that they added these stamps oh and that we can have our black puffles come along too! My name is scoobyred on club penguin. 12 of them it took me 20min. I already have nine of them! 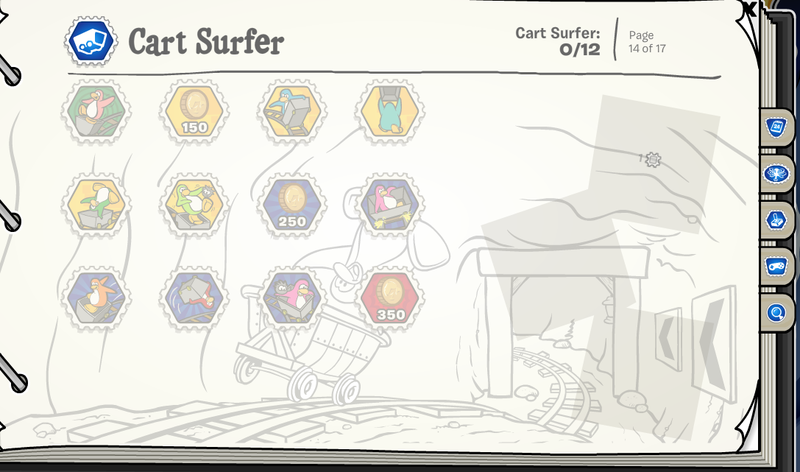 I'm really good at cart surfer. It looks like some of you guys have trouble, eh? Don't worry, they'll fix the glitch soon. They work on mine. Now I have 99 stamps(one one the wii game, but can't get it online, lol). Happy collecting! P.S. The wii game is SUPER FUN(sorry 'bout the caps). I totally recommend it. It'll work soon. I'm pretty sure it will. I'm really positive. Really. I have nine of 'em! It's real easy. Hm. I only have 98 stamps. I earned one on the WII game but oh well. You're lucky. I think more games will get on the stamp book and I also think that more puffles will join the game! What do you think? The stamps now work! I have them all! hey mimo do you still use your other account, colacanth1?? just missing one stamp Cart Surfer. yeah!!!! i already have them all!! Try again tomorrow. Its just temporary. It probably will work later today or tomorrow. These stamps are so easy, I got 9 of them in 17 minutes... well, at least they're easy for me. Heh heh... I got all the stamps in exactly 30 minutes... you get a double coin bonus for doing it! I have got 11 stamps! Yes, there was a bug with the stamps but has now been fixed! Yeah, me too. They should add something like "Get to the Other Side without crashing." Or, Get 100 points in one move." Or at least something! Hello mimo. It is really weird! The EPF command room is just gone! My screen is completely white! What is going on?